Demolition Robot – Number 5 is alive!! All Areas Demolition Excavation have purchased a Husqvarna DXR 140 Remote Controlled Demolition Robot, which we have nicknamed “Number 5”. These robots are the latest, cutting edge technology that are fast, efficient & offer the maximum safety benefits to our employees. Currently, we are the only demolition company between Sydney & Brisbane that has a demolition robot as part of their equipment fleet. We pride ourselves on having the latest equipment available that improves our efficiency & maximises the safety benefits for our workers. Being remote controlled, the demolition robot provides for maximum operator safety whilst demolishing structures & is fast & efficient to operate. 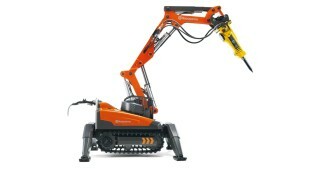 The operator is able to control all functions of the robot through the remote control which removes the need for the operator to physically access areas that may pose a danger to safety during the demolition. The robot can climb stairs remotely, operate on uneven surfaces & close to walls. With individually controlled outrigger legs for stability & no harmful emissions from the electric motor, the robot is safe to operate in all situations. The demolition robot can be used for both internal & external demolition, confined spaces, demolition of staircases, roofs, walls, concrete and sensitive internal locations. At less than 80 cm wide it can fit through standard doorways for ease of access to your job site. As it is such a compact machine, this allows for ease of operation & transport, yet it has a superb power to weight ratio. The versatility of the robot is maximised by the use of attachments – it can be equipped with a breaker (jackhammer type head), bucket or crusher head. This allows the one machine to be used for a variety of tasks – breaking up concrete, tearing down walls, stairs, ceilings, just about any demolition application you can think of. The robot also offers the added benefit of isolating the rest of the building from impact loads during jack hammering procedures. Please watch our video below which shows “Number 5” in action breaking up concrete on one of our job sites.